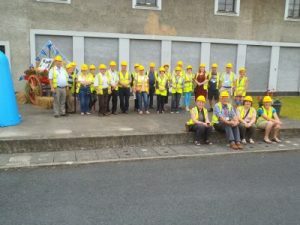 cal Society went to Ardnacrusha on a pre – booked tour of the Hydro – Electric plant. They were taken on tour by four young students who gave them and excellent and informative tour of the workings of the historic station which was completed in 1929. Public tours are ​available from July 1 to August 31 2017. Visitors are welcomed to the Ardnacrusha Experience at the newly refurbished visitors’ centre before going out on site to view the impressive headrace canal, locks and tailrace. Once inside the station, the living heritage of Shannon Scheme is brought to life through a series of animations which celebrate the history and impact of this iconic project. Visitors are given access to the very heart of the station with unique views of the turbine hall and a visit to the original control room. The guided tours can accommodate groups of up to 30 people and runs for approximately 90 minutes. Silvermines Historical Society Members at Ardnacrusha.